Reliance JioPhone has not officially gone on sale, but it looks like Indian customers are set to get more 4G feature phone options across networks. Just days after Reliance Jio announced its 4G-enabled JioPhone, Intex has unveiled a similar offering called Turbo+ 4G. And this is a 4G VoLTE feature phone, though it will be only be available around Diwali. Another telecom player Idea Cellular has also announced plans for a 4G feature phone, but at a possible price of Rs 2500. JioPhone is geared towards feature phone users in rural and urban India, who can't pay for an expensive smartphone. 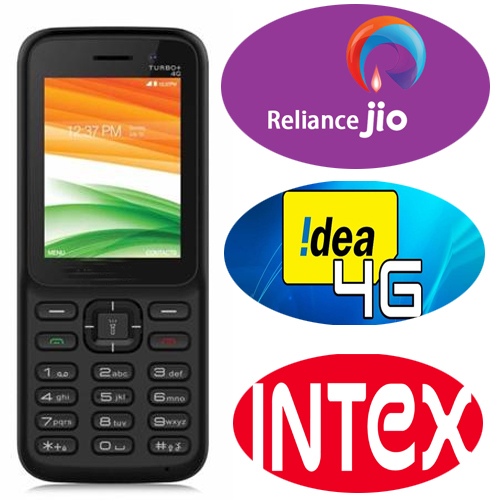 Reliance is targeting India's 50 crore feature phone user base, which is still mostly on 2G. And it is hoping to win these people over by marketing the phone as 'essentially free', even though the JioPhone comes with a Rs 1500 deposit upfront (refundable, but after three years). This doesn't include the cost of monthly data packs, which starts at Rs 153. For starters, Idea announced it is working on its own 4G-enabled phone that will cost Rs 2,500. Unlike JioPhone, which will only comes with support for the company's suite of apps, the new Idea phone will give users the freedom to download the apps of their choice, Idea Cellular's Managing Director Himanshu Kapania was quoted as saying by PTI. Other than this, we don't know much about the Idea feature phone.